One weekly plan for those who already have one of my apps or book. 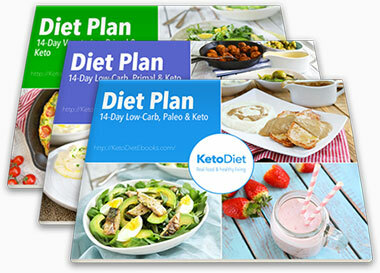 > For your convenience, I have also created a PDF version of this diet plan that you can download here! 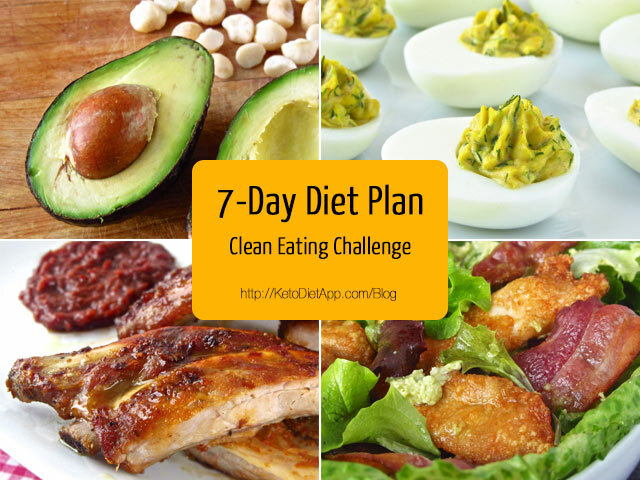 > > For those of you who have a busy life style: 7-Day Grab & Go Keto/Paleo Diet Plan. > For those who can eat dairy: 2 Week Ketogenic Diet Plan. As a reminder, although I usually do use dairy products and healthy low-carb sweeteners, this challenge includes neither. One of the reasons is that if your weight is stalling, avoiding dairy products and all sweeteners may help. In a nutshell, during my challenge, you won&apos;t be eating any grains, sweeteners, dairy, legumes, most fruits and starchy vegetables, while keeping your net carbs intake at 25-30 grams per day or less. To learn more about what to eat and what to avoid, check out my 30 Day Clean Eating Challenge post. Although the exact macronutrient ratio, especially the protein intake, varies for all individuals, the carbs intake is recommended to be at around 25 grams of net carbs in order to get in ketosis. You can calculate your ideal protein intake using KetoDiet Buddy. Remember, the ketogenic diet is naturally sating and you won&apos;t need to count calories. Do your shopping in advance and don&apos;t buy anything you won&apos;t need to eat. Some foods may not last if you buy them a week in advance. In such case, place them in the freezer or buy just a few days before you cook. If you need to take any food with you to work, cook it the day before. Feel free to swap meals (dinner for lunch, etc.) according to your needs. Snacks are not always needed, you can use them to sate your appetite. Keep an eye o your intake of magnesium, potassium and sodium. You can add more foods rich in electrolytes, just check out my post here. Electrolytes are essential for your health and weight loss, especially over the first few days of the ketogenic diet. For those who use KetoDiet iPad app, it&apos;s perfectly normal to have values higher than the RDA / EMR. If you want to avoid pesticides in fruits or vegetables, check out this list of fruits and vegetables. It will tell you which ones are worth getting organic. According to the weekly meal plan below, your carbs intake will always stay under 20-25 grams (it&apos;s recommended to stay below 25 grams of net carbs if you have just started). If you need a snack, opt for healthy suggestions from this list. All Day Keto Breakfast - Egg, bacon, 1/2 avocado with pink Himalayan salt or sea salt, 2 portobello or other mushrooms, 1 tbsp ghee. You can have a few bacon rashers. Autumn Oxtail Stew - In case you cook just for yourself, make 2 servings and keep the rest for tomorrow. You can use any other type of beef suitable for slow-cooking. If you don&apos;t have bone broth at home, you can get ready-made one, just avoid products with additives. You&apos;ll use the second serving throughout the week. If you need to take it to work, prepare it on a day in advance and place the meat and lettuce in separate boxes before heating. Grilled Chicken & Blackberry Salad - You can use fresh or frozen berries (thawed). If you don&apos;t have blackberries, use raspberries, strawberries or even cherry tomatoes. Tomatoes have less carbs, so you can use twice the amount. Also, instead of fruit vinegar, you can use your own sugar-free vinegar or just olive oil. You can save time by cooking the chicken in advance and have it ready in the fridge. Omelet topped with 1/2 serving of Autumn Oxtail Stew - Use the remaining oxtail from yesterday as filling for your omelet made from 3 eggs, 1 tbsp ghee and salt (pink Himalayan or sea salt). Caprese Skewers with 1 avocado instead of mozzarella cheese and crispy bacon rashers or a few slices of high-quality pastured ham. You can simply prepare a salad without skewers and place in a container to take with you to work. Also, be aware that my home-made pesto includes parmesan cheese. To prepare a dairy-free pesto recipe, simply blend 2 cloves garlic, 1/3 cup almonds, 1/4 cup extra virgin olive oil, 1 bunch basil, splash of lemon juice and 1/4 tsp salt. Baked or pan-roasted fish with a big bowl of green salad (greens such as lettuce, spinach, chard, rocket, spring onion, olive oil and lemon juice). Have a look at this recipe for simple baked salmon. If you don&apos;t like salmon, use other types of fatty fish such as mackerel or trout. Creamed coconut milk with nuts and berries - 1/4 cup blackberries, raspberries or strawberries (fresh or frozen), handful of almonds and 1/2 cup creamed coconut milk with a pinch of cinnamon (avoid sweeteners). To find out how to "cream" coconut milk, have a look at my post here. Make sure you place the can in the fridge overnight before you use it. Keto tuna salad - 1 tin tuna, 1 small head crunchy lettuce, 2 hard-boiled eggs, 1 spring onion, splash of fresh lemon juice, salt, 2 tbsp home-made mayo. Cajun Chicken Tacos - Avoid cream (use coconut milk or beef bone broth instead). Pumpkin & Beef Sautée - In case you make it just for yourself, prepare 2 servings and keep the rest for tomorrow. Keto Omelet Wrap - Avoid cream cheese and butter, use ghee, lard or coconut oil instead of butter. You can use ham or cooked meat instead of smoked salmon. Pumpkin & Beef Sautée (leftover from yesterday). Egg & Celeriac Nests with crispy bacon rashers. BBQ Pork Ribs - Make 1/2 the recipe if it&apos;s just for you. Eat with pan-roasted asparagus (1 bunch) drizzled with olive oil and lemon. The net carbs in asparagus are similar to leafy greens (1.8 g net carbs per 100 g / 3.5 oz) - eat to satiety. Butter-roasted Prawn & Blackberry Salad - Included at the bottom of this post. If you don&apos;t have blackberries, use raspberries, strawberries or even cherry tomatoes. Tomatoes have less carbs, so you can use twice the amount. Also, instead of fruit vinegar, you can use your own sugar-free vinegar or just olive oil. Shamrock Eggs with Braised Spinach - 2 green pepper rings, 2 eggs, cup of spinach (or more), bacon, 1/4 onion, 1 tbsp ghee, salt. BBQ Pork Ribs - Leftover from yesterday. Eat with pan-roasted asparagus (1 bunch) drizzled with olive oil and lemon. The net carbs in asparagus are similar to leafy greens (1.8 g net carbs per 100 g / 3.5 oz) - eat to satiety. Note that this meal plan does not contain snacks. As individual requirements vary, you can add healthy snacks from this list to sate your appetite. Some recipes contain home-made ingredients. If you don&apos;t have them ready in your fridge, you&apos;ll have to add them to the basket in KetoDiet separately. Also, make sure you have selected the right amount of servings when adding to the basket! Breakfast ham cups - Avoid cheese and eat with 1/2 avocado. Simple grilled trout, eat with Crispy marinated asparagus - You will need to make Basil pesto or any other dairy-free pesto for the fish. Thai-style chicken with "peanut" sauce - You can use any home-made nut butter (avoid peanut butter), eat with Broccoli & cauliflower purée. Ultimate keto coffee - avoid stevia and any sweeteners. It&apos;s very sating but if it&apos;s not enough, have an extra snack or try Poached eggs on a bed of spinach instead (the same amount of net carbs). Leftover Thai-style chicken with "peanut" sauce, eat with Broccoli & cauliflower purée. Smoked salmon & avocado salad. 1/2 avocado, hard-boiled egg and Crispy bacon or a few slices of high-quality pastured ham. Warm Niçoise salad with quail eggs - You can use 1 regular egg and tinned tuna instead of quail eggs and fresh tuna (the net carbs will be the same). Beef & kale cutlets, eat with Crispy marinated asparagus. Pecan nuts and 1/2 cup berries (raspberries, strawberries or blackberries) - You can add 1/2 of creamed coconut milk with a pinch of cinnamon (avoid sweeteners). To find out how to "cream" coconut milk, have a look at my post here. Make sure you place the can in the fridge overnight before you use it. Leftover Beef & kale cutlets and Cauliflower pesto mash. Crispy Caesar salad with "avonnaise" - Use dairy-free options for "breading" (flax meal, coconut flour, almond flour or crushed pork rinds). Avocado lettuce cups - you can add Crispy bacon. Crispy Caesar salad with "avonnaise" - Use the leftover chicken. Faux Spaghetti Bolognese - Avoid optional ingredients and cheese. Devilled eggs - Add ham or avocado if needed. Leftover Faux Spaghetti Bolognese - Avoid optional ingredients and cheese. Roasted Lamb, eat with Simple tomato & rocket salad. Red cabbage & zucchini pancakes - Add avocado, ham or Crispy bacon if needed. Leftover Roasted Lamb and Grilled zucchini. Sardines & avocado spicy wraps - you can use any fish like salmon or tuna. Hi Martina, I just downloaded the 7-day diet plan. My husband and I are preparing to begin the keto diet, in an attempt to reverse early signs of dementia. Can you explain why it is necessary to avoid cream, butter and cream cheese? I understood that full-fat dairy has only a trace of carbs, so it would be acceptable for Keto eating. Can you please explain this? Thank you! I just downloaded the app and tried to add meals from the 7 day plan. Is there an easy way to do this? Hi Laura, you can add the meals listed in each diet plan from the integrated blog (last tab) to the Planner. Then you can plan your days with the meals listed in the diet plans. The diet plans cannot be added with "one-tap", because they are not integrated in the app, they are mainly available on my blog as free eBooks. We may, however, do that in the near future together with other features. We are currently working on a universal app but we will add more features after it's done. How many grams of protein are these days averaging? Why no stevia? Hi Lara, to find your protein intake, try our keto calculator: KetoDiet Buddy - Easy Macro Calculator for the Ketogenic Diet You won't need to meet your targets exactly every day - it's just an estimate but will give you a good idea. This diet plan will provide 70-85 grams of protein on average. Also, here are more plans, some include sweeteners: ketodietebooks.com/ (I haven't included sweeteners in every keto diet plan because some people want to avoid all sweeteners). Thank you so much! As a failed keto-er with very picky eating (hate bacon and ground beef), everything looks so delicious! My doctor offered a 7 day meal plan that had "21" meals that somehow were all identical (bacon & eggs EVERY morning), cheeseburgers for lunch, and steak & salad for dinner. No wonder I failed, eh? You've offered such variety and I love all the pretty pics. I can't stop txting my boyfriend about how excited I am to go grocery shopping! (And, of course, thank you for the convenient shopping list. YOU ROCK! I intend to follow the 7 day plan. I am not a fish eater but I see what I can swap out for it so I am not worried about that. My husband loves fish so he is excited that I will cook him a fish meal for a change. I see that I can swap out lunch for dinner or even skip a meal if I am not hungry. What I'm wondering is if I must change my breakfast every day. I love the "All day breakfast". Can I eat it every day or is it important to add variety? Thanks. What are your thoughts on Coconut GREEK yogurt? Its dairy free and need to add probiotics. Do you have an iphone app package that has the all of 7 day keto recipes in 1 place for the 30 day challenge? (similar the ipad app, the menus on the ipad app look awesome). I'd purchase it in a heartbeat! Thank you for all of your hard work and making this affordable.! Hi Kim, thank you for your kind words! Currently, you can view this post and all my posts in both the iPad and iPhone apps (my blog is integrated in the apps). The iPhone app is "basic" and doesn't have the planner or the functionality of the iPad app. However, we have been working on a universal app which will bring all the features of the iPad to the iPhone. This will take a few more weeks / months. Once it's done, I'll post any updates & news on my FB page and blog. I came across it by following other keto dieters instagram feeds. I wanted to get your opinion on hemp seeds? Do you believe that they fit nutritionally within the keto/paleo model of eating? I am also wondering when you will launch your app for android? I used this day diet plan and after a week I loss 5 pounds of my weight but there is a problem with me I cant leave the sweet dish after the meal any how I am trying to leaving. thanks for the post through which I got motivation. Thank you so much Michelle! I really appreciate that. The fact that my blog and apps may help people deal with their health condition / weight issues is by far the most rewarding part of my work that keeps me going! Can I please have info. sent to me at the e-mail address? thanks! 2 days, 2 pounds lost yeah!!! Love your website and your app! Since I don't have the groceries, I'll start the plan tomorrow. It would be great if you could do more diet plans, maybe a "simple" one for non-cooks and very busy people?  Thanks again! This is the be keto website! I've been doing your challenge since last Monday and have already lost 4 pounds all that after my weight was stalling for the last 3 months! Thanks so much for all your work, all your posts are so informative. I have the iPad app with all the new recipes and will try this meal plan from tomorrow. I'll just have to up my magnesium a bit more, maybe from almonds  Are you planning to make more meal plans? That would be great! Thank you for all your kind words! I'm glad my challenge helped with the weight loss plateau and that you are happy with my app! I haven't included any snacks like nuts but if you add a handful a day, it should boost your potassium intake. I got some feedback and I'm planning to make more plans, definitely one with very simple meals that require common ingredients and almost no cooking time  It would be great if you could leave a review on the AppStore. Thanks again! Wow!! I can't thank you enough! 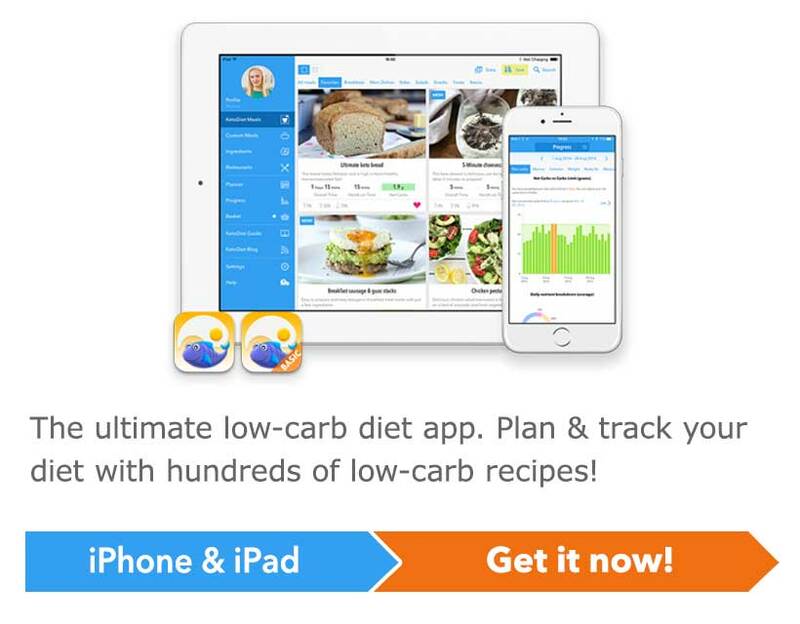 Just got your iPad app, I can't believe how easy is to do keto with your app, it has all I ever wished for in a diet app  can't wait for the iPhone sync! Thank you Tim, I'm glad you like my app! The iPhone sync in now our next target! Thank you Elisabeth! I really appreciate it!